Liberty’s Ben Roderick fires from three-point range during the first half of Wednesday’s OCC showdown against host Olentangy. 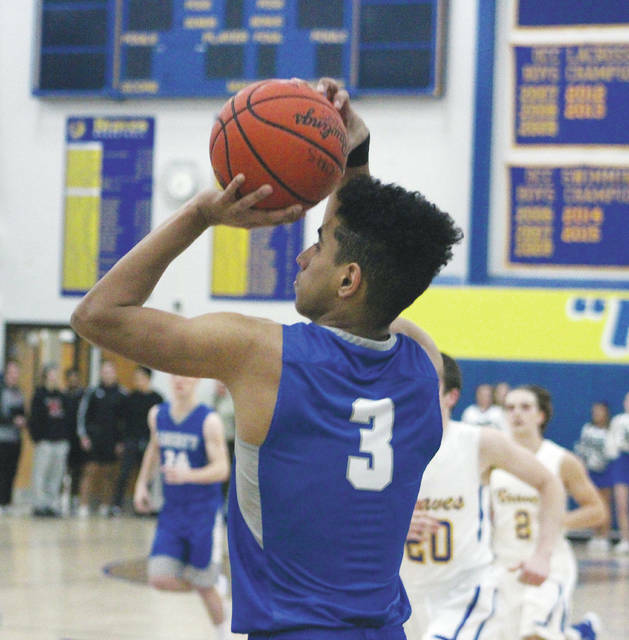 Olentangy Liberty junior Ben Roderick scored a game-high 27 points in Wednesday’s 73-66 OCC win over host Olentangy — the first eight of which made him the first 1,000-point scorer in boys basketball in school history. But, his night came to an abrupt end when he slipped on a wet spot and injured his knee with 3:26 left in the game. Liberty held a four-point lead at the time. The Patriots hit 12 of 15 free throws down the stretch to hold off the Braves and keep their slim hopes alive for an OCC-Buckeye title. Olentangy came back from a 16-point deficit in the first half — trailing 43-29 at the break — using a 13-2 run in the second half to get as close as one. Sean Marks scored eight points during the rally to lead the way. Roderick scored underneath to end the rally and hit a pair of key three-pointers to push the lead to two possessions in the fourth quarter before leaving the game. Nick Nakasian knocked down seven of his eight free throw attempts in the final minutes to finish with 17 points and help Liberty put the game out of reach. Mitchell Kershner hit two of Liberty’s seven first half three-pointers in the opening quarter, including one that tied the game 11-11. Kershner finished with 10 points and Dan McFarland added nine for the Patriots (10-7, 4-3), who have won five out of their last six games. Roderick knocked down a pair of free throws to give Liberty the lead for good at the 4:34 mark of the opening frame. He hit threes on back-to-back possessions of the second quarter, including the one that gave him his 1,000th point at the 6:12 mark to give Liberty a 26-13 lead – its largest of the game. Marks led Olentangy (8-8, 1-6) with 20 points, Alex Sieve added 14 and Jerred Kinnaird chipped in 11. Both teams continue league play Friday night at 7:30 p.m. Olentangy hosts Westerville Central while Liberty welcomes Westerville North.